After the release of the last START data exchange in 2009 it has become rather difficult to get a good breakdown of the numbers of deployed launchers and warheads - the aggregate New START numbers leave too much room for uncertainty. Still, it's been a while wince the last update, so it is time a new attempt to make sense of the New START numbers. According to the most recent data exchange, as of 1 September 2013 Russia had 1400 warheads associated with 473 deployed launchers. It is 19 launchers and 80 warheads less than in March 2013 - quite a significant drop. It's hard to get the structure of the strategic forces working back from these two numbers, so I'll try to start with what we know about deployed systems and then see if the numbers match (although I know that they don't). The bombers, with all the uncertainty, don't affect the final numbers much. Although we don't know how many of them are counted in New START as deployed, the previous estimate seems to be reasonably good - 11 Tu-160 and 55 Tu-95MS. In 2009, Russia declared 13 operational Tu-160 bombers (there were also seven test aircraft), but it appears that one or two bombers are in overhaul at any given time, so if we count operational ones, then the number is probably closer to 11. Tu-95MS bombers are more difficult to count, but at some point there was a plan to have 59 of them in 2009, so, given that about two would be in overhaul, 55 seems like a reasonable estimate. New START counts each bomber as one deployed launcher and one deployed warhead, so the 66 bombers would be counted as carrying 66 warheads. In reality, they could carry more - Hans Kristensen suggests that "a couple of hundred weapons are present at the two bomber bases." There is more information about submarines, as they are relatively easy to count. However, we do not necessarily know whether a particular submarine is loaded with a full complement of missiles and, in fact, how many warheads these missiles carry. There is, for example, some uncertainty about the Liner version of the R-29RM missile - it could carry four, eight, or ten warheads. I think there is a good reason to believe that all new R-29RM missiles still carry four warheads, but we don't know that for sure. The two Project 955 Borey submarines, Yuri Dolgorukiy and Alexandr Nevskiy, which were transferred to the Navy this year, still have no missiles on board, so their launchers would not be counted as deployed for the New START (or any other) purposes. Submarines of the Project 667BDRM class have been gradually completing overhaul, so right now five of the six submarines of this type would be considered operational - Tula, Bryansk, Novomoskovsk, Karelia, and Verkhoturie. Ekaterinburg is still at the Zvezdochka plant in Severodvinsk undergoing repair after the fire in December 2011. It is expected to return to the fleet in 2014. Assuming that the five submarines are loaded with missiles, the Project 667BDRM fleet would account for 80 launchers and 320 warheads. Of the three Project 667BDR submarines based in the Pacific, only two stay in Vilyuchinsk - Sv. Georgiy Pobedonosets and Podolsk. Ryazan was transferred to the Zvezda plant near Vladivistok some time in 2012, so it is safe to assume that it had its missiles removed. As for the two submarines in Vilyuchinsk, only Sv. Georgiy Pobedonosets appears to be in full readiness - most recently it launched a missile during the strategic exercise in October 2013. There have been no news about Podolsk for more than a decade now, so it's not clear if that submarine is alive. If we assume that it is, Project 667BDR submarines contribute 32 missiles and 96 warheads to the New START count. If the assumptions above are correct, the share of SLBMs in the New START aggregate numbers is 112 missiles and 416 warheads. All this leaves about 300 launchers and a bit under 1000 warheads in the Strategic Rocket Forces. To be exact, the numbers are 295 and 918 respectively, but this would imply the accuracy that these number just don't have. There are five different types of ICBMs that are currently deployed - R-36M2/SS-18, UR-100NUTTH/SS-19, Topol/SS-25, Topol-M (both silo and road-mobile), and RS-24 Yars (only road-mobile so far). It appears that the Rocket Forces operate 52 R-36M2 missiles. These are deployed at two bases - Dombarovskiy and Uzhur. I assume that Dombarovskiy has 24 (in four missile regiments) and Uzhur - 28 (also four regiments, of which one has ten missiles). With ten warheads per missiles, 520 R-36M2 warheads account for roughly half of all ICBM warheads and for more than a third of all deployed nuclear warheads. Until recently UR-100NUTTH missiles were deployed at two bases - Tatishchevo and Kozelsk. Since the Kozelsk division is being prepared to host silo-based RS-24 Yars, I assume that all UR-100NUTTH missiles have been removed from that base. This would leave 40 operational UR-100NUTTH missiles with 240 warheads in Tatishchevo. Topol is a single-warhead road-mobile missile that appear to be deployed with the divisions in Yoshkar-Ola (27 missiles), Vypolzovo (18), and Barnaul (36). 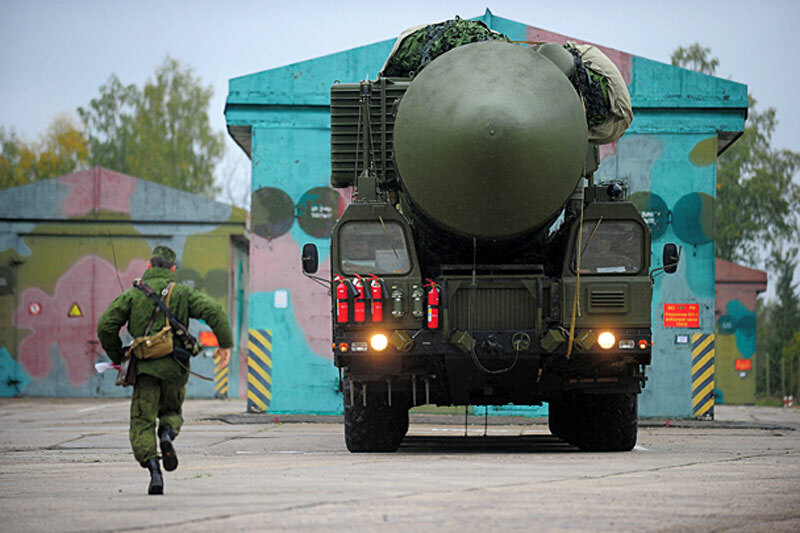 In addition, there are still some Topol missiles in the divisions that are being converted to receive RS-24 Yars - I assume that there are 9 Topol ICBMs in Irkutsk and 18 in Novosibirsk. Overall, this would add up to 108 Topol ICBMs with 108 warheads. Topol-M is also a single-warhead missiles that is currently deployed in 60 silos in Tatishchevo and on 18 road-mobile launchers in Teykovo. This means that Topol-M adds 78 missiles and 78 warheads. Finally, as of the end of 2013, the new RS-24 Yars - a MIRVed version of Topol-M - was deployed with two regiments in Teykovo (the total of 18 missiles), one regiment in Novosibirsk (9 missiles) and one incomplete regiment (6 missiles) in Nizhniy Tagil. It is not clear if the 15 missiles in Novosibirsk and Nizhniy Tagil would be included in New START as deployed launchers - they became operational only at the end of the year - but they would have to be included in the final number. One of the problems with RS-24 Yars is that there is no official data on the number of warheads associated with the missile. At some point it was believed that it has six warheads, but in his more recent estimates Hans Kristensen, who seems to have good sources, lists the missile as carrying four. I would trust his number (and also note that if it's six then it is much more difficult to reconcile the New START launchers and warhead numbers). So, as of the end of 2013, Russia seemed to have 33 RS-24 Yars ICBMs with 132 warheads (only some of them would be included in the September 2013 New START data exchange). The ICBM bottom line is that at the end of 2013 Russia was estimated to have 311 missiles with 1078 warheads. One problem with the numbers above is that if we add everything up, we'll get 489 launchers and 1560 warheads. The number of launchers is roughly compatible with the New START data, but the warhead count is much higher - by more than 100 warheads. I am not quite sure how to explain this difference. One possibility is that missiles were (temporarily) removed from one of the submarines and (permanently) from some of the ICBMs (e.g. from some UR-100NUTTH). We'll have to wait for the March 2014 data to see if they help clarify the situation. To sum it up, I estimate that in January 2014, Russia had 489 operational strategic launchers - 311 ICBMs, 112 SLBMs, and 66 bombers. The total number of strategic warheads associated with these launchers was about 1700 - 1078 on ICBMs, 416 SLBM warheads, and about 200 nuclear weapons that could be delivered by bombers. Pavel, Thanks for the elaborate update. Composition of Russian present and future launchers and warheads seems really uncertain. If all the current subs (Deltas) are operational, then navy should have 144 operational SLBM and 528 warheads. When ( say around 2020) all 8 Borey become operational, navy should have 128 launchers and 768 warheads. And it is really difficult to guess what will be the composition of ICBM forces when START treaty deadline comes closer. The way things are going Russia won't be able to deploy more than 200 ICBM if they continues to deploy 6 warheads on RS-24 and on future heavy ICBM. There will be only 78 single warhead ICBM (Topol-M) at around 2020, rest of the launchers will be 6 warheads ICBM assuming all the SS-18 being withdrawn by that time. Only 200 weapons for 66 deployed bombers are really surprising, 66 bombers can potentially carry around 600 weapons (minimum). An unpredictable and uncertain strategic force as far as the numbers and composition are concerned. I'm curious whether eroding numbers of Russian strategic launchers and warheads is actually deliberate ie. stepping down to a posture of minimum deterrence in line with China's stated position as well as that of Great Britain. The biggest threat to Russia from "other heavily-armed nuclear powers" would seem to me to be their large conventional forces. In light of this,the best deterrence would be numerous small tactical nuclear warheads of which we know Russia has a significant arsenal. While not an ideal world, it would mean that the number of weapons that could conceivably start WW3 could be reduced to 25 single-warhead MARV equipped missiles with guaranteed ABM penetration, with a clear message of no first use - but, that an ICBM attack on Russian territory results in a city-by-city counter-value response. Is it possible that Russia and China could lead the way out of the Cold War era of thinking that there must be parity of strategic nuclear launchers and warheads for there to be working deterrence? I'm not sure I understand the argument, but I don't think Russia is planning on reducing its strategic arsenal. There are a number of strategic systems in the pipeline. Historically, the 1500 deployed nuclear warhead number came from President Putin; during his first administration. It was a number Russia could afford and it seemed the right balance for Russian security. Having the American sign-on to New START, from the old SORT agreement, was just a bonus. There is no advantage to the Kremlin in reducing numbers lower than the before agreed 1500. Curious to the production of nuclear warheads for the vastly changing Russian arsenal. Will Russia “re-use” existing warheads or build new? Is the single warhead on the SS-25 Topol being used on the RS-24 Yars for example. Are the SS-18 warheads going to be used on the new, heavy liquid fueled ICBM? As I understand, these are all new warheads. Unlike the United States, Russia has no problems remanufacturing warheads or building new ones. It's a standard practice. It could be the same (or very similar) design, of course. But as far as I know, the warhead for Bulava is a new design (although it was tested back in the 1980s). It's probably true for other warheads. Interesting comment. I would not say the United States has had “problems” updating its nuclear warheads; although, it could be argued that new warheads could have been built more economically and expediently than the remanufacturing Life Extension Programs (LEP). It is a “politics over technology” issue. The U.S. built its last nuclear weapon in 1989 and last tested a weapon underground in 1992. The current American Nuclear Policy calls for no “new” nuclear warheads. What constitutes “new” is open for debate. However; the Pentagon’s attempt to build a new warhead fleet called the Reliable Replacement Warhead (RRW) was not approved by Congress back in ’07. The RRW was a Lawrence Livermore National Laboratory retinkered version of the previously tested but never-deployed W89 warhead. The US has been very reluctant to pull out any nuclear designs that haven’t gone through actual physical testing to confirm yield, design, and structure. Los Alamos contends that today’s sophisticated computer modeling would suffice, but that opinion has never been shared by the Pentagon or Congress. "Since the Kozelsk division is being prepared to host silo-based RS-24 Yars, I assume that all UR-100NUTTH missiles have been removed from that base"
"Старые шахты сейчас активно переделывают под новый комплекс. Правда, не все. Когда-то в Козельской дивизии было 60 ракетных шахт и 60 «Стилетов». Сейчас осталось только двадцать. Десять шахт взорвано, двадцать законсервировано, десять переделывают под «Ярсы». На остальных боевых позициях, где «Стилеты» еще стоят на боевом дежурстве, несут службу офицеры, прапорщики и солдаты соединения"
"In addition, there are still some Topol missiles in the divisions that are being converted to receive RS-24 Yars - I assume that there are 9 Topol ICBMs in Irkutsk and 18 in Novosibirsk"
Pavel, if you will see 2013 photos in Google Maps, Bing Maps and Terraserver then you find that there are two active regiments in Irkutsk. Also why you have not Topol regiment in Nigniy Tagil? There are three regiments, two of them are converting to Yars, but one is still having Topol. All of this can be seen on maps. How are nuclear weapons for the newest missile systems from those that are gradually removed from service? - Development of modern technologies in the field of construction materials, microelectronics, information creates the conditions to optimize the performance of existing nuclear weapons, and the newly created. The ones that are removed from service, are able to perform combat tasks, but due to technical and physical aging are less effective than modern counterparts. They fall short in important characteristics, such as life and, just as importantly, the safety of operation. To improve the safe operation of the modern nuclear weapons introduced devices and systems, excluding their involvement and unauthorized use, but ensure their full-time job for combat use. Design of modern nuclear weapons provide protection against accidents of natural and man-made, while maintaining a safe condition after exposure to ammunition damaging factors such as fire, shock or drop. In the newly developed nuclear warheads based on innovative materials and technical solutions that can significantly reduce the time for their service and training for combat. He is Yury Sych. The last name could be roughly translated as "owl", but I'm not sure you do that. anik: These are good points. However, if you add 20 UR-100NUTTH and their 120 warheads, reconciling the numbers would be much harder. I'd rather doubt Litovkin's information (but I know I'm on thin ice here, of course). On Topol, one of the regiments in Irkutsk (в/ч 52009) was reported incomplete some time ago - in 2012 - so, I assume missiles have being withdrawn from there by now. I'm not sure we could reliably tell the difference between Topol and Topol-M on satellite imagery, but even if we could, it's hard to know if Topols are still deployed or have been removed. Pavel, you have 311 operational ICBMs. What are you thinking about Karakayev's words? "В боевом составе РВСН сегодня находится около 400 пусковых установок с межконтинентальными баллистическими ракетами. [...]", — сказал Каракаев. I find it quite unlikely. In the last START data exchange in 2009 Russia declared 367 deployed ICBMs. That included 174 Topols, 70 UR-100NUTTH, and 59 R-36MUTTH/M2. Even if I am wrong about UR-100NUTTH, there are no more than 60 of these now. The number for R-36M2 was 52 in 2012, I believe. I don't have the Topol balance, but at least 5 regiments have been decommissioned since then - about 45 missiles, say. So, it is about 60 ICBMs fewer than in 2009. On the other side of the ledger, 10 silo and 3 road-mobile Topol-Ms have been added, as have 33 Yars. So, the number for ICBMs should be about 15 missiles lower than in 2009 - something like 350-355. It's not quite 400, but I guess Karakayev could have rounded it up. Then, even with 355 ICBMs, to get the total of 473 launchers, one would have to assume that only three submarines out of seven that are nominally in service have missiles on board. It's possible, of course, but doesn't seem likely. Having said that, I probably shouldn't discount the possibility of a 350-ICBM force (but not 400 ICBMs). I'll try to play with numbers. Any suggestions about possible configurations are welcome. Pavel, Hans Kristensen has 55 RS-20V SS-18 ICBMs in his latest Nuclear Notebook (2013). Agreed on the submarines. When the fire broke out on the K-84 Ekaterinburg, nuclear missiles were aboard. (reported after as fact) If a Russian nuclear ballistic missile submarine was in dry-dock for structural repairs with weapons, it would seem to me that most, if not all, of the operational submarines are “loaded”. Conclusion is mine. there are currently 162 topols, t-m's including. plus four yars regiments. I don't think you could get 162 missiles, even if you include Topol-Ms. If you keep Topol in all regiments that haven't yet been converted to Yars, there would be 132 missiles. Plus 18 Topol-Ms (I assume we don't count 60 silo-based Topol-Ms). The Problem with RV-20 is, whether we can assume the deactivation of a half regiment. That is Regiment 735 with 10 missiles and the Regiments 269, 302, 229 with 6 missiles each. That is 28 msl. There we had until recent 5 regiments (175, 206, 368, 494 and 767) with 6 missiles each. That is 30 msl. I don't know which Regiment is deativated (or cut to the half now). If a complete regiment is down then we would have 24msl. And a total of 52. But 55 looks strange to me. About Topol: it is rigth that we can find excellent images on Bing maps which can pinpoint the garages left. At Irkutsk the Regiment 586 ( в/ч 52009) seems to be deactivated. The fact that the garages are still left in place is secondary. They could be saved to accept the RS-24. It might be that Regiment 344 still has 9 Topols at Irkutsk but it is also possible that Irkutsk is empty now - except that regiment 92 is preparing to take RS-24. 2 rambo: you can easily tell yars site from topol. they zero topol site to the ground and them build everything anew. takes some time. check the process with earlier kristensen publication on teyk and then use various sources (not just bing) and screen other sites. two irk sites prepared for beginning, two others are still alive. one novos site is also prepared for beginning. two sites (novos and tagil) are visible on google under construction last year. Thank you. This is interesting. But as far as I can tell, Topol-M shelters are the same size and built where the Topol shelters were. So, it's often hard to tell. Then, what matters is whether the missiles are there. For example, of the two Irkutsk regiments that still had Topol in 2012, one (586th) was reportedly incomplete. basically true. But not all Topol sites got complete rebuild - depends on the situation found. 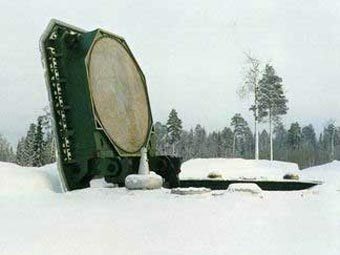 For example the first RS-24 site was here 56.809028° 40.173461° (pictures published: http://militaryrussia.ru/i/284/430/3D00m.jpg - seen from here 56.810883° 40.171571° looking west). This base did not had reconstruction. 2 anonymous: What I mean is the 3rd regiment in Irkutsk (which appears to be the 586th regiment or v\ch 52009) was incomplete at the end of 2012. The 1st regiment (v\ch 48409) did not have Topols at the time - it was converted to Yars training regiment. The 2nd regiment (52933) reportedly had all its Topols in place. 2 rambo: it was a mod pr-dept. deception joke - people were taken to the t-m site and shown 311 tel. you can't tell a t-site from a t-m site but never miss a yars. thank you: 2nd (dec 13) and 3rd are still around, while 1st and 4th are krona-free. yars conversion works will be visible with tearing everything to the ground flat (take a look at the novos site using ge historical imagery layer). tag site is of different origin, but follow the same pattern. 3rd is regiment 29 (currently re-arming to RS-24). Garages already down. "it was a mod pr-dept. deception joke - people were taken to the t-m site and shown 311 tel"
Interesting info! That was my first thought...that the whole thing was a show. The 311 was placed here 56.810883° 40.171571° and here 56.809213° 40.170599° for foto session. My Guess was that the two RS-24 units are here 56.933225°40.544239° and here 56.917293° 40.308655°. "– Можно назвать, сколько ракет тут будет стоять на боевом дежурстве? – «достаю» я офицера своими расспросами. – Ведь по договору СНВ эта информация должна быть открыта. – В полку 10 ракет – 10 «Ярсов», – говорит заместитель командира соединения. – В перспективе у нас будет три ракетных полка – 30 ракетных комплексов"
If we summarize this info with info in previous Litovkin's article, then we can say that now one regiment is converting to RS-24 and two another regiments now have active RS-18B and in future will be converted to RS-24 too. right: three silos at different stages of conversion. anik: Yes, I agree that the division will keep three regiments. The question is whether RS-18 missiles are still in silos. As I said, it's quite possible that they are, but in this case it's more difficult to reconcile the numbers. On the other hand, it's fairly reasonable to assume that the missiles have been removed. For example, if you look at the Google Earth image of the silo in your link, the image of 7/24/2010 shows some activity around the silo, which is likely related to that missile being removed - that was long before the construction activity started. Kozelsk: Yes it is Regiment 74 (77193) which will receive the RS-24. A more simple explanation for the variance between the September START declared amounts and your January 1st estimated amounts maybe in the R-36 ICBM totals. You have a total of 489 deployed launchers versus a declared 473 and 1560 warheads versus 1400 declared. If you have 16 less R-36 ICBM's with their 160 warheads would give an exact equal for both categories. I base this on having read in the past that it was estimated that no more then 40 R-36 M2's were manufactured. Food for thought. No, the number of deployed R-36M2 was at least 58. And there was a Ukrainian/Yuzhmash source that said that 52 were deployed in 2012. So, I'd be skeptical about 40, but it's an interesting possibility to consider. dombar seems to have 24 operational silos as of last year. first reg began conversion at the time. Pavel: One more question about Dombarovski. Have a look at a panoramio 51.068477° 59.700615° and at the sign! Obviously this silo 51.065618° 59.693783° is / was a Dnepr launch site. It is part of the disbanded 621 Regiment with 10 R-36Utth. Now under re-construction for RS-24. Bernd: Thank you. I think you are right. Details in this video http://www.youtube.com/watch?v=MXaGYVx1ipc seem to match the Panoramio photo and the satellite image at 51.065618° 59.693783° (silo 1-1). "Now under re-construction for RS-24"
Who said this officially? Last time Karakayev said that there will be new complex in 13th division. If it is Yars he would say about it. "Перевооружение идет в Новосибирской и Тагильской ракетных дивизиях, это касается той же Домбаровки, где также ведутся работы еще по одному ракетному комплексу", — сказал Каракаев. anik: Thank you. That explains it. The 1-3 site matches the video much better. The only thing is that there are no towers seen on satellite imagery, but these could be later additions - the Google Earth image is from 2003. Something can be seen at Bing. I agree that it's not RS-24 that will be deployed in Dombarovskiy - http://russianforces.org/blog/2013/12/some_new_missile_system_to_be.shtml. It appears that some other work is done there. Any thoughts about the possibility of a launch from Dombarovskiy in September - http://russianforces.org/blog/2013/12/test_of_a_hypersonic_vehicle_i.shtml? "The only thing is that there are no towers seen on satellite imagery, but these could be later additions - the Google Earth image is from 2003. Something can be seen at Bing"
"Any thoughts about the possibility of a launch from Dombarovskiy in September"
So both sites are amoung the "deactivated" 10 Silo field of former 621 Regiment. The new construction activities (see panoramio position 51.063939° 59.600857° ) are also in this field (either for RS-24 or preparation for "Sarmat". BTW: Pavel did you notice that two Silos of the 6 Silo field of Regiment 206 are deactivated? It is here 50.837875° 59.595079° and here 50.884145° 59.732269° (see Panoramio pictures). That would lead to 4x6 plus 1x4 Silos = 28 Silos at Dombarovski and to a total of 56msl. Bernd: Globezoom link doesn't work - it asks for a login. As for the decommissioned silos, I doubt they would keep a regiment with 4 silos, so it is more likely that there are 24 active missiles in Dombarovskiy. Yep...Bing got an update there. single silo is an old ss-18-to-topol onversion: seems to add equipment. one of the two original ss-19-to-topol conversion seems to undergo even more changes. lcc might possibly add new command&control equipment - hight time if mew missiles come for tests. SS-18 in Plesetsk? I don't think so. I'm not sure about SS-19 - if I remember correctly, these were declared as SS-24 silos in START (although these seem to be the same silos). look back start mous '91: 8 test silos for ss-24. plus separate lcc silo (either 222 or 155, not sure). all silos were converted variant of the ss-19 type (obvious reasons). except one which was a special project for test conversion of a "heavy" silo for ss-24 firings. in the nineties it was modernized for t-m tests. always on video or pictures. the last publicly available mou shows three silos available for t-m tests. btw., one more ss-18 silo was planned in '09 for conversion for the needs of npo mash. bernd can easily find it at t-t.
No SS-18 silos were declared in 1994 (and I don't think there's ever been one in Plesetsk anyway). he has a rectangular lid - like SS-18. Maybe an SS-13. Later on the silo was re-constructed. But for what program? Yubileynaya (or Serebryanka) reconstructed for RS-22. And there is another site with reconstruction. "I think Serebryanka (or Yubileynaya)SS-13 was here 62.919479°41.687877°"
You are not right. Yubileynaya is active. The silo that you show is removed. "62.910327° 41.676817° was SS-24 from the beginning"
Maybe. Many things are not clear from book about Plesetsk cosmodrome written in 2007. There is a note that two RT-2P silos were reconstructed for RS-22 (one of them Yubileynaya) and two silos were built on Loshchina site. no silo site. This site (LC 158) was and is a test site for mobile launchers"
At first, Lazurnaya is former site with two RT-2/RT-2P silos. There is a note in a book about Plesetsk cosmodrome that silo(s) was(were) built on Lazurnaya for RT-2/RT-2P. And there is a map on http://www.ww2.dk/new/rvsn/graphics/plesetsk%201968.jpg - see two silos 23/24. Lazurnaya was reconstructed for Topol. Thank you very much for your Infos! I simply didn't know that - I just have evidence that both sites (LC 167 left and right - don't know the Russian designation) were/are in use for Topol type launchers. I always thought that would be either LC 157 or LC 167 - a site for SS-15 and SS-16 tests with mobile launchers. Did you ever heard of LC 157? I shall try to summarize info about RT-2/RT-2P silos. There were 10 silos for launches and storage and 1 command and control silo in Plesetsk. Info about RT-20P pads and silos. There were 2 pads, 2 silos for launches and 1 command and control silo in Plesetsk. There were 2 pads in Plesetsk. In previous message about Temp-2S I meant 2 pads for test launches. There were 4 silos for launches and 1 command and control silo in Plesetsk. There were 4 silos for launches in Plesetsk. There are(were) 5 pads for launches in Plesetsk. There are 3 silos for launches in Plesetsk. 62.966334° 40.733635° (at least one foto evidence)"
I am sure that all RS-22B/RS-22V launches were from Loshchina (area 161). Correction: Loshchina is area 163. It’s not only about “the two lamps”. There is a small building at Loshchina which you can see on one of the photos. The building is directly next to the “two lamps” in between two rails. It is missing on some other launch pictures. And the "“two lamp” structure might be present at the “western sites” in the past, too. Moreover in these pictures you can see more than one rail track and there is no small building in between them. But I have no source for “my” western launch sites. One last question, anik. I’m fighting since years to position the SS-15 mobile launch pictures at LC 157-158. Do you know where the massive launcher once stood (coordinates)? The first launch of RS-22B was from Loshchina. It is fact. There were built four launch points with different rails on Loshchina directly for RS-22B/RS-22V test launches. Why did they use another site? I doubt that they used another site for test launches, maybe it is the same site but reconstructed. As for RT-20P test launches, I am sure that they used area 157/158 for them, maybe it looked differently than it looks now. Thanks! There seems to be another launch site at 62.781976° 40.591424°. 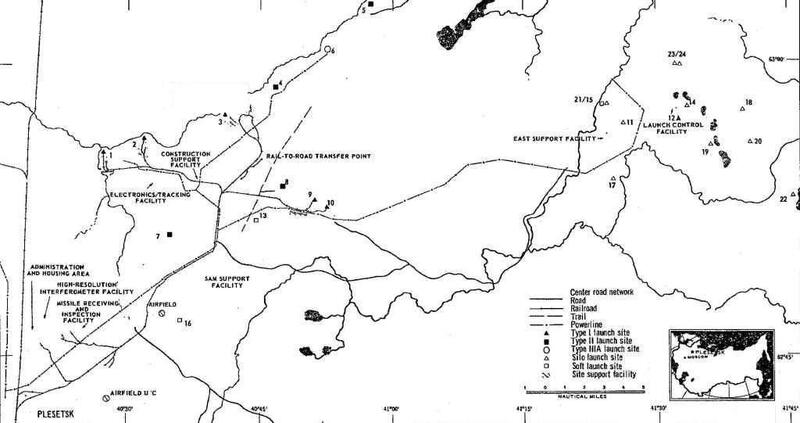 CIA map shows this as “site 16” correlated to tests with SS-X-16. Obviously one Silo and one Pad.